Welcome to the Holiday Inn Express & Suites Columbus, Texas. 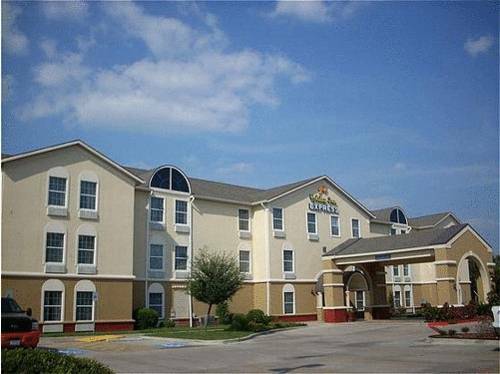 Our hotel's comfortable guest rooms and spacious suites offer area travelers the best value among hotels in Columbus, TX. We are conveniently located three miles from historic downtown. The Columbus Municipal Building and Columbus Chamber of Commerce are just a mile away along with other business destinations. Looking for a fun getaway? We are 28 miles from Splashway Water Park and 46 miles from the Katy Mills Mall. Special events are Columbus' specialty with the Live Oaks and Dead Folks Tour, the Columbus Folk Fest, Ladies Night Out, the Colorado County Fair as well as many sporting events. Leisure travelers find plenty to do near the hotel such as museums, art gallery, restaurants, boutiques, and a first class healthcare and surgical center. Antique shoppers will find abundant shopping locally as well as being only 34 miles from Round Top. Outdoors enthusiasts can venture to the Colorado River which is only 3 miles away. Hotel guests have access to such fun amenities as an outdoor pool and a fitness center, as well as useful resources like a business center and free Wi-Fi access. Those planning small gatherings can take advantage of the hotel's meeting room, which is suitable for up to 50 guests and has audio/visual equipment and a helpful staff. The free Express Start breakfast bar promises a great start to each day. Begin planning your trip today for a great experience you are sure to love! Enjoy a fine dining experience at this locally owned operated restaurant. Nancy's offers a full menu that includes an appetizing selection of soups, salads, sizzling steaks and seafood pasta entrees. The restaurant also offers a full bar. Los Cabos Mexican Grill offers you the finest in Mexican cuisine. Come and dine with us and enjoy our fine food and great atmosphere. We are located in Columbus TX, On Highway 71. Take Exit 696 on I 10 and then South on 71. Owner Nelda Hadjik manages to ensure that this shop stays packed with 40 dealers to welcome you with antiques, crafts, gifts, angels, prints, and other keepsakes.